The Sheaf Filter represents a technological breakthrough in the field of fiber filters. It combines excellent and enhanced performance in the fine filtration spectrum of 1-10 microns, minimal maintenance, absence of chemicals and an efficient back washing system utilizing less than 1% of the overall flow. Our advanced proprietary design with lenghtwise flow allows us to achieve the best combination of operational efficiency, energy reduction, and environmental impact minimization. The Sheaf Filter acknowledges the bond between global water scarcity and the ability to provide each client with a unique tailor made solution using well designed engineering and the uppermost attention and service. The Sheaf Filter runs at a competitive cost to conventional media and sand filters while performing finer filtration and averages 50% less expensive than other fiber filters. Ability to adjust thread type to client’s special liquid characteristics: high chemical resistance across the pH range or acidic materials, broad temperature span, high concentration of hydrocarbons etc. Filtering stage: The Sheaf Filter is made of tens of thousand of threads held as a sheaf inside a cylindrical chamber. The number of chambers defines the volume of the filter. While filtering, the contaminated water enters the lower part of the filter and flows from the bottom to the top. By the force of the water flow and by differential pressure in the vessel, the sheaf is squeezed into the chamber, filling it up in an even and balanced way. The water then flows lengthwise through the micron channels created by the spaces between the threads. An important part of the filtration occurs at the first contact of the water with the sheaf, where the pores created among the threads are the first barrier to the dirt. Further filtration occurs by cappillary phenomenon as the water flows through the micron channels inside the sheaf. 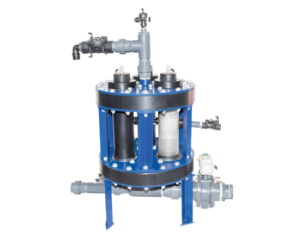 The shape of the threads, their designed surface area as well as the period time it takes the water to flow through the filter enable the smallest suspended solids to be intercepted and adhere to the threads. The final result is a remarkable, fine filtration. Backwash stage: The Sheaf Filter activates the self-rinsing by either time intervals or differential pressure. The backwash functions using opposite flow of water into the chambers and sheaf, with the addition of air pressure. The opposite flow and change in pressure in the vessel cause the sheaf of threads to move down and partly outside the chamber, in a way that the area of the filtration cake is in a wider space and opens by itself and by the pressure of the clean water and air. That guarantees an efficient wash to the main area of contamination in the sheaf. The rest of the sheaf gets rinsed inside the chamber by the water flow direction and alternate cycles of water and air that create turbulence and movement throughout the threads. Each pulse of water and air during the backwash sequence takes only 3 seconds.